There was training session coming up that I was very interested in. It was expensive, $3000, but it would be important for the work I do and I could provide new services for my clients and increase my income. I was set on doing the training but this large amount was going to have to come from somewhere and pretty quick. The registration deadline was coming up soon, so I said, “Alright Universe, bring me the $3000.” That being done, I began to make some moves myself and not just sit around. I decided to call the person in charge of the training sessions and asked if I could pay $1500 over time and $1500 before the class. After a moment, the trainer accepted my offer. Great, I am almost there! There was another training class that was offered for an additional $1000. This increased knowledge would be good for my business as well as create a larger financial hurtle. I did have the $1000 on hand, but I was determined to manifest it from elsewhere instead. Every day I kept my thoughts focused on the $2500 balance required for both training sessions. I was clear in knowing the money would come through, even though I didn’t know the when or how. In a short time, I got a call from a conference organizer in Iowa inviting me to be a speaker and facilitator at their upcoming event. Not knowing exactly how it would turn out financially for me, I accepted. At the least, it would provide some additional income toward the training sessions I had signed up for. I went to Iowa where everything worked out beautifully and the timing was perfect. I made enough at their conference to cover that $2500! The training was important to me and even though it seemed out of reach financially, I didn’t admit to it. I asked for help and did my part by negotiating payments and saying yes to the Iowa speaking opportunity. All worked out nicely. I still have a balance to pay back but it is within my budget to do so and with the new tools from my training sessions, I will have the additional income to make it happen even quicker. Looking back, the money was never a problem because I didn’t think of it that way. 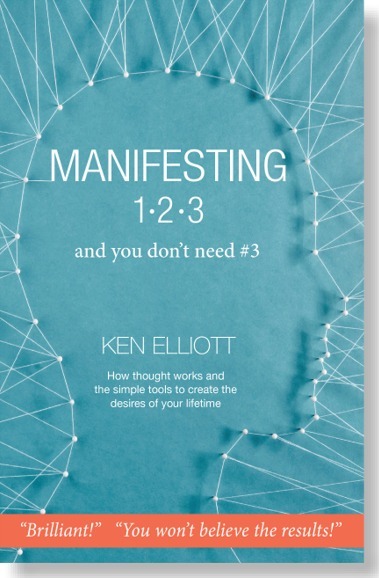 Go to the Interviews Page to see and hear Ken talking about Manifesting 123 and you don’t need #3. There is new information here and you won’t hear it anywhere else. It is so simple. Make it work for you! LOVED, LOVED, LOVED everything you had to say. As always, I enjoyed your humor and wit. I found myself giggling out loud… I have already begun to write the script for “my movie.” You said to me, “What do YOU want?” I realized I am always wishing for others. So I started putting little notes together last evening. This morning my husband and I had a good laugh over the items I thought I wanted. After reading further, I got more serious—and more careful about my wording. I get it! The author’s technique is “The Secret” on steroids!